by Megan Creamer, 1st year student, MPhil Textile Conservation. 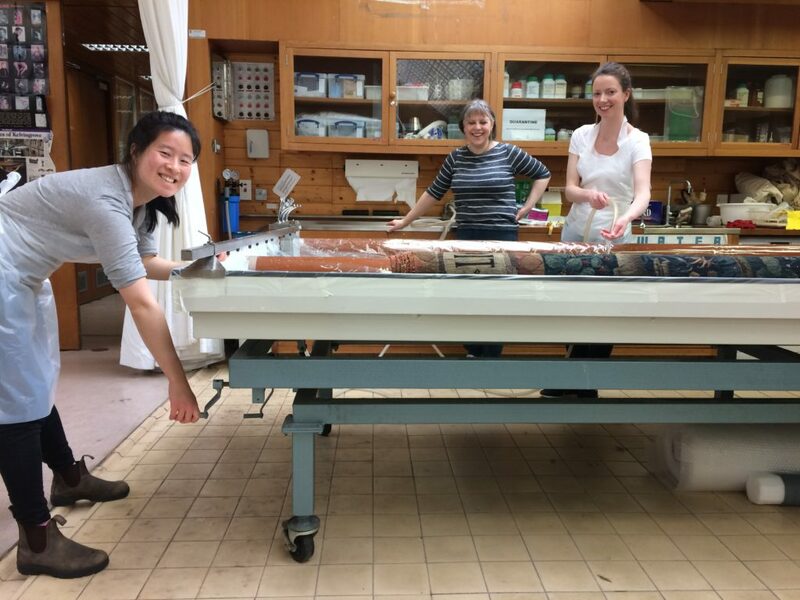 While on break this spring, Staphany Cheng, Aisling Macken, and I had the opportunity to assist with wet cleaning a large 16th century tapestry at the Burrell Collections with textile conservator Helen Hughes. 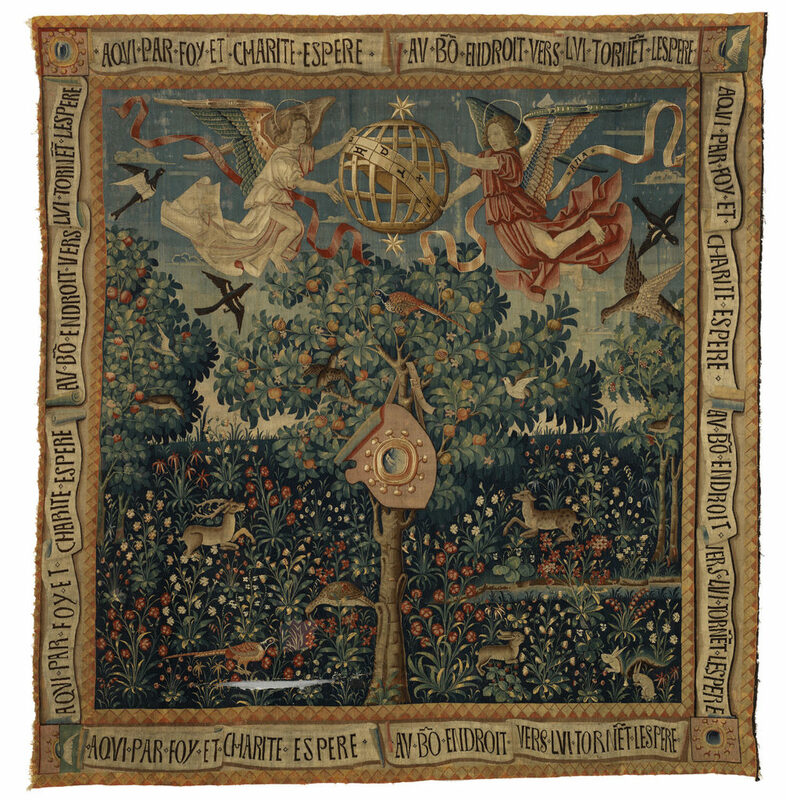 This French/Flemish tapestry, Verdure with the Arms of Miro, spent many years of its existence on display in homes and galleries throughout the centuries before being purchased by Sir William Burrell around 1932. While discussing this object with Helen to get a sense of its condition and history before working with it, we learned that the tapestry was one of many that are part of a research project on the Burrel Tapestries that is due to be published in August 2017. Image © CSG CIC Glasgow Museums Collection. Verdure with the Arms of Miro, shown from the front and back. This tapestry depicts the coat of arms of the Miro family. 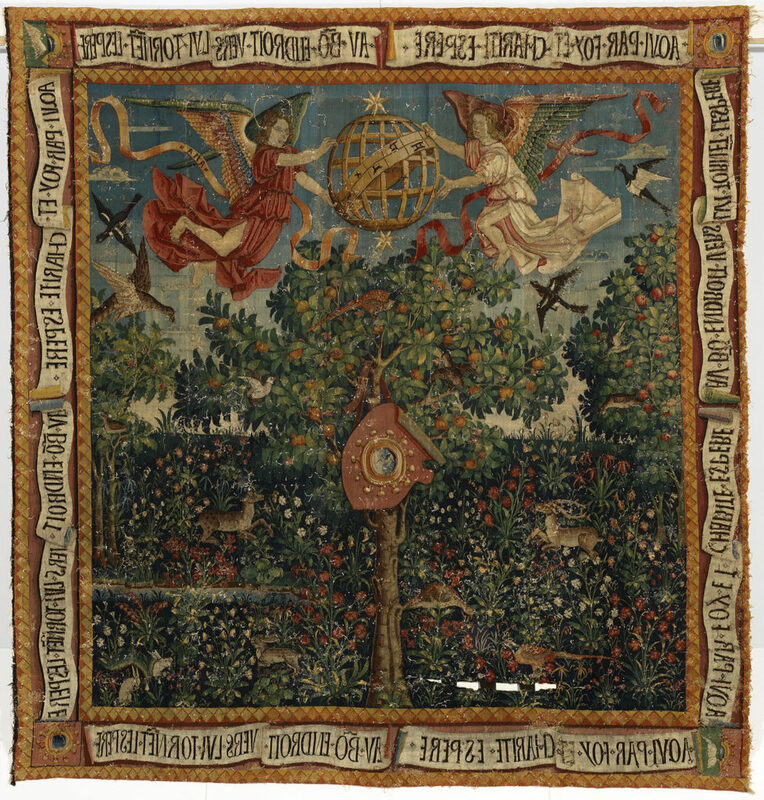 Two angels float in the sky above a tree in fruit, with birds, deer, and rabbits in a scene of lush greenery. On the central tree hangs a large mirror – a near homophone of the name Miro, an interesting hint of humour from the early Renaissance era. Images © CSG CIC Glasgow Museums Collection. As students at the CTC, we had all wet cleaned objects as part of our studies, but this was our first tapestry, as well as the largest and oldest object any of us had yet wet cleaned. Helen, as an experienced tapestry conservator, discussed the organization of the project and the tight time schedule. One aspect critical to the success of the project was working seamlessly as a team. This included sponging at a similar rate and pressure so that the tapestry was evenly cleaned, and moving the wet tapestry safely for the object, and for all us. The wetter the tapestry got, the heavier and more fragile it became. The wash table in the textile conservation studio at The Burrell was not large enough to accommodate the full width of the tapestry, which meant it would be cleaned in sections, partially rolled to manage the size. 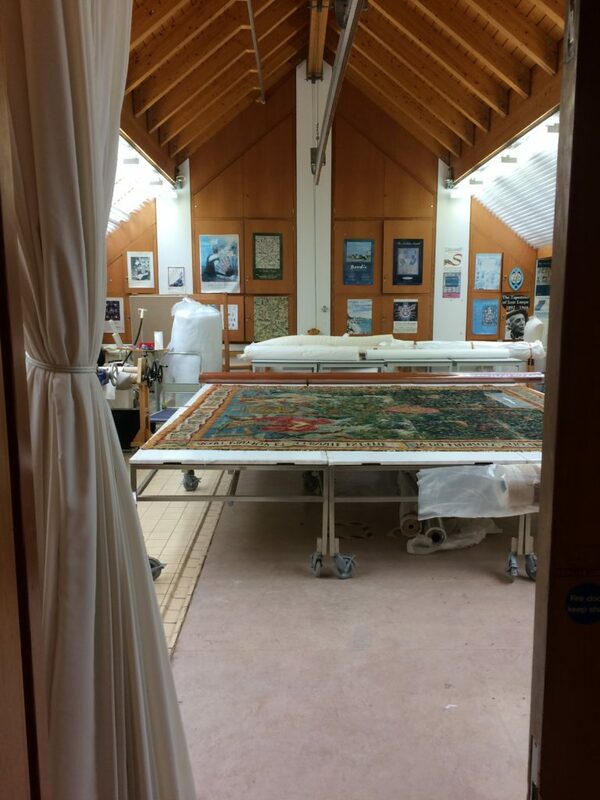 The Burrell social media manager took a great video with some audio of Helen explaining our process, and shows how it took four people to safely move the wet tapestry to clean each section. Staphany, Helen, and Aisling adjusting the wet cleaning table and wetting out the tapestry. Image by Megan Creamer, 2017. The tapestry took some time to wet out, which is not unusual, as the sooty soiling from centuries of wood smoke and coal fires that covers many historic textiles is not water soluble. Each section was wet out with soft water, and then sponged methodically with a non-ionic detergent solution. This was worked in a minimal amount of liquid, and then rinsed with soft water. This process allowed the yellowing compounds of age-related degradation, and the sooty particulate soiling to run off in the rinse water. Each cleaning cycle released soiling in different levels, as the bond between the soiling products and the textile were loosened through the chemical and mechanical actions of cleaning. 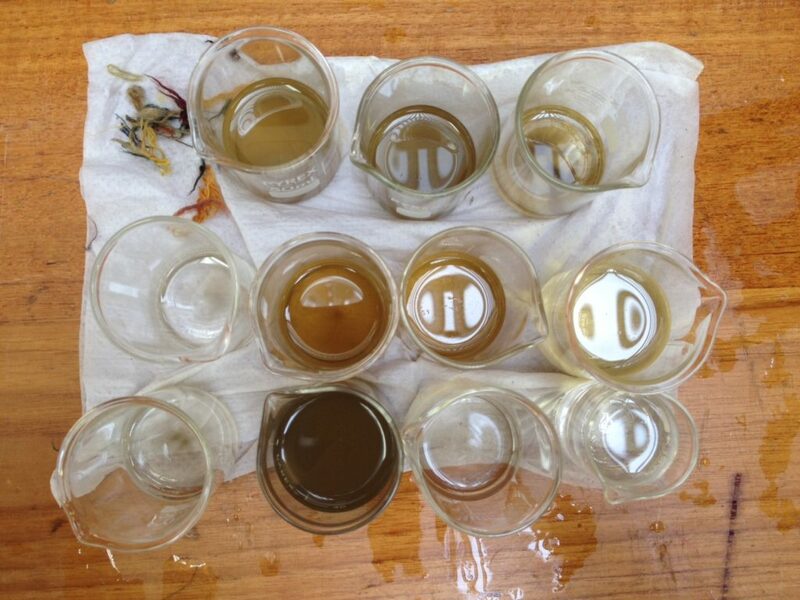 Samples of soiling release from the many cleaning and rinsing cycles. Some sections contained heavier, or different soiling components. Small loose pieces of wool were collected and put aside. Image by Staphany Cheng, 2017. Once the cleaning cycles were complete, the tapestry was rinsed extensively with deionized water to ensure removal of the detergent solution (Miro_Megan_Rinsing). In the wash table, the tapestry was blotted dry with towels in sections. The tapestry was then moved across the room, rolled flat on tables, and further blotted with clean cotton fabric, then left to air dry. The removal of soiling had visibly improved the visual aspect, making the colours a little brighter and the design more distinct by removing soiling that had given the tapestry a yellow-grey cast. More importantly however, the removal of this soiling is crucial to extending the life the of the tapestry, as soiling tends to be highly acidic, which can cause structural damage to the fibres and rapidly degrade the textile. Aisling, Staphany, and I are grateful to have assisted Helen in carrying out wet cleaning as a critical conservation step in the long history of this tapestry. The skills, teamwork, and facilities to wet clean something of this size and age were all new experiences for us that built on our work at the CTC. It was a great opportunity to learn from Helen and work in the conservation lab at The Burrell before the facilities are moved as part of building refurbishment, with a planned re-opening in 2020. Working through the logistical and physical challenges of wet cleaning a large tapestry over a 10-hour day, with an experienced conservator was a wonderful opportunity. Thank you to Helen, the Burrell Collection, and Glasgow Museums for this opportunity. 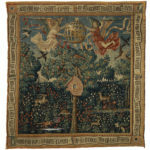 Take a look at the Burrell Collection tapestries online to see more of the collection. The Arms of Miro tapestry drying flat in the Burrell Collection conservation lab. Image by Megan Creamer, 2017.